I hadn’t realised – it’s been a while since I stopped by the counter – that there was a full range of skincare. This isn’t a reflection on the skincare, btw, but I’m a magpie-shopper, and my attention is always drawn to the jewel-like shades of the eyeshadows before anything else! I was especially drawn to a pot of Beta-Hydroxy pads which promise to help you resurface your skin – something I’m almost literally obsessed with at the moment, thanks to a surprise birthday present that I’ll be reviewing for you soon – and a balm which promises 8hr Cream-like results without the, ah, “liniment”-like scent. After a long chat, and a nice cup of tea, I was sent away with a couple of samples to try, and you can see them above, (top to bottom) High Volume Mascara in Jet Black, Eye Base Essentials in Demure, and a 24 Hour Eye Shade pencil in Topaz. 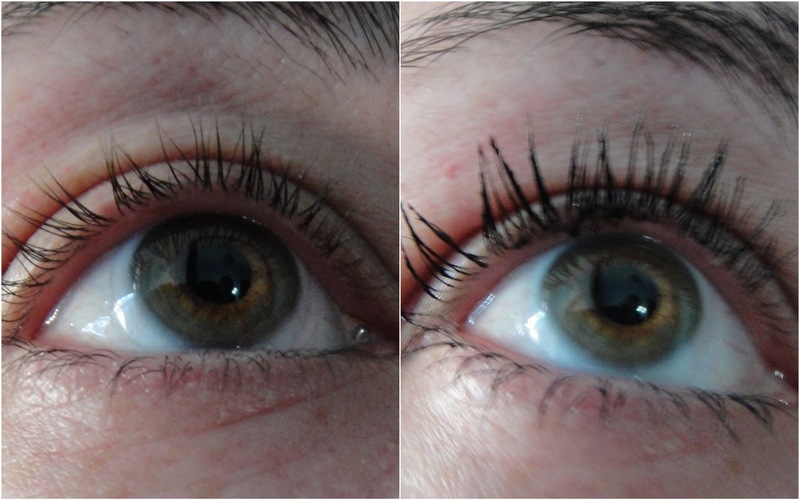 For some reason, these photos don’t entirely do the mascara justice, yes it doesn’t lengthen quite as much as my most recent mascara-love Le Metier Anamorphic, but it does volumise a lot more, giving, I think, a far more dramatic effect over all. I’ve used it every day since picking up my sample, and it’s been perfect in this hot weather, being impervious to heat, sweat and (to an extent) tears! Love it. What I like about the Eyebase Essentials is that it comes in a selection of 8 shades, and a selection of finishes. 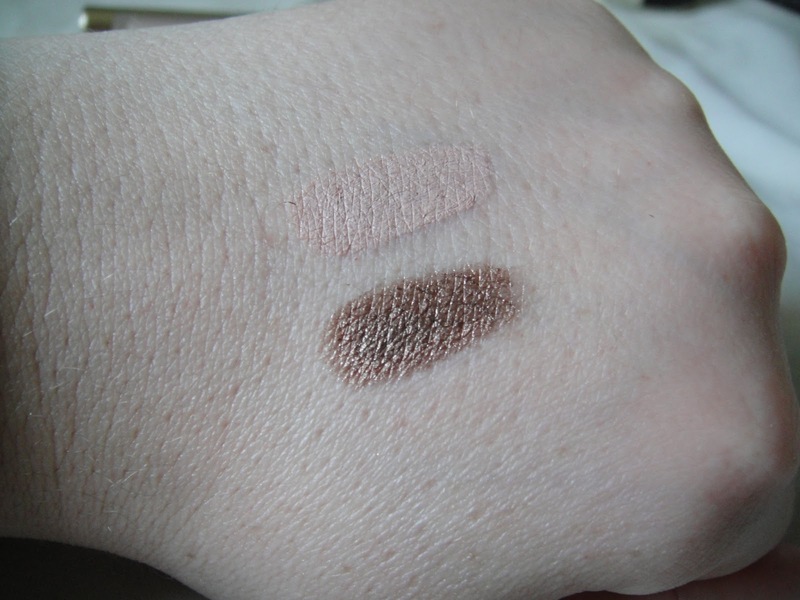 Shown above is Demure which is a rather cool-toned lightly pinked beige, with a faint sparkle, but there are peaches, and light taupes, all perfect as either skin-toned shadows in their own right, or they make a great base for your powder shadows. I’ve noticed they don’t last quite as long as Urban Decay Primer Potion, but they do give you a bit more slip, so they’re far, far easier to blend over. The 24 Hour Shadow pencil in Topaz is a beauty, a multi-tonal bronze shade, you can either apply it heavily (as in the swatch) or sheer it out with your fingers or a brush after a quick sweep over your eyelids. After a few seconds, the shadow will “set” (you don’t have to work as quickly as with Ellis Faas, for example) and it will last. A very long time. The sheerer you make your application, the less time you’ll have before it creases, but I estimate that even then you’ll get a minimum of 6 hours crease and fade-free wear. If you apply it more heavily, you’ll be wearing a perfect shadow look until you decide to take it off. There are four colours in the range, and I’ll be heading back out for the grey one very soon. Trish McEvoy products are exclusively available from Harvey Nichols and Selfridges. The Fine Print: I own a fairly extensive collection of Trish McEvoy already, but the products featured in this review were supplied for review purposes. Unless you consider tea a bribe, I wasn’t compensated in any way for this review. It’s not, by the way. A bribe, that is. Even Selfridges tea isn’t that good. I really like the mascara on you! the brand seems interesting, will defo check it out in Selfridges. Love the shadow, wonderful colour. Topaz looks lovely! I haven't been to a Trish McEvoy in years but always liked there little palettes. You also made me realise that the Suqqu mascara I have is a tubing one from your description. No wonder I've been struggling to get it off with my usual technique! Oops.